Owl City is an American electronica project created in 2007 in Owatonna, Minnesota; it is one of several projects by singer, songwriter and multi-instrumentalist Adam Young. Young created the project while experimenting with music in his parents' basement. Owl City developed a following on the social networking site MySpace, like many musicians who achieved success in the late 2000s, before signing with Universal Republic Records, now Republic Records, in 2008. After two independent releases, Owl City gained mainstream popularity with the 2009 major label debut album Ocean Eyes, which includes the six-time Platinum single "Fireflies". The album was certified Platinum in the United States in April 2010. In June 2011, Owl City released its third studio album, All Things Bright and Beautiful, which was followed by The Midsummer Station in August 2012. Owl City has recorded songs for several animated films, including Legend of the Guardians: The Owls of Ga'Hoole, Wreck-It Ralph, The Croods and The Smurfs 2. Owl City also has released several charting singles, most notably "Good Time" and "Fireflies". Adam Randal Young (born July 5, 1986) is Owl City's founder and only constant member. He was born in Ottumwa, Iowa and raised in Owatonna, Minnesota, where he graduated from Owatonna Senior High School and then found work at a Coca-Cola shipping warehouse. He began composing melodies in his head while working, which he would then record in his studio in his parents' basement. Young is a devout Christian and stated that his faith is the only thing more important to him than music. He has described himself as introverted and believes he has symptoms of Asperger syndrome; however, it has not been diagnosed. Suffering from insomnia while working loading Coca-Cola trucks, Adam Young began to compose music, recording with a C-1 Behringer Microphone. Among the software that he began with was Reason from Propellerhead. He began uploading songs recorded in his parents' basement to Myspace. He started to receive favorable attention for his music and then helped cultivate this nascent fanbase by being an open and accessible web presence, responding to any messages he received and constantly posting blogs. His manager Steve Bursky later highlighted the significance of Young's engaging online manner in building his following saying: "People feel like they know him, like they've got a direct connection to him because of how he approaches his connection with them online." Through a deal with the digital aggregator CD Baby, he then started making the songs available for sale through iTunes. In 2007, Owl City released an EP titled Of June, followed by the 2008 release of the album Maybe I'm Dreaming. Of June reached No. 15 on the Billboard Electronic Albums chart, and Maybe I'm Dreaming peaked on the same chart at No. 13. "I think they saw Owl City as representing the future of our business. This idea of a kid in a tiny town in rural U.S. being able to make songs in his basement that sound like Top 40 radio could never have happened ten years ago. By hiring a young management company who understands the business circa 2011 over a seasoned industry vet, who might not understand the online spaces well, showed a lot of understanding of where this kid was going to end up having success." Owl City's label deal with Universal Republic was finally confirmed in February 2009. According to Bursky there was initially some disagreement about the direction Owl City should follow, telling HitQuarters: "They were ready to send him into the studio with big producers and polish him up to try to become this thing that he wasn't. But we put our foot down and said, 'Look, the reason you signed this kid is because it's working. Whatever it is about him—his music, his interaction with his fans, his brilliance in the online space—these things are connecting with people, and as soon as you change that you lose what's special about this artist.' To their credit, they really listened and they got it." Ocean Eyes, Owl City's major label debut, was released on iTunes on July 14, 2009, with the physical release following on July 28, 2009. The album debuted at No. 27 on the Billboard 200. Owl City released three singles from this album: "Umbrella Beach", "Vanilla Twilight" and "Fireflies". "Fireflies" topped the US and Canadian charts. Ocean Eyes reached the top ten on the US album charts, topped the US electronic charts, and also reached Amazon MP3's top 10 most downloaded album list. By April 2010, it was certified Platinum in the United States. On January 24, 2010, Owl City reached the No. 1 spot in the UK Top 40 Singles chart with "Fireflies". The song "Tidal Wave" also received significant airplay on Christian music radio stations. On January 2, 2011, it was revealed "Fireflies" was the 20th most downloaded song of all time in the UK. Young was joined by Breanne Düren on several tracks; the most notable example of which is "The Saltwater Room". Owl City's live band consists of Breanne Düren (background vocals/keyboards), Matthew Decker (drums), Laura Musten (violin), Hannah Schroeder (cello), and Daniel Jorgensen (vibes). Relient K vocalist Matt Thiessen has toured and collaborated with Owl City on several tracks, including "Fireflies", where Thiessen can be heard providing the backup vocals. Young also produced Relient K's song, "Terminals". "Fireflies" was released as a free download on the game Tap Tap Revenge 3 by Tapulous. Prior to the July 14, 2009, Internet release of Ocean Eyes, and the "Fireflies" single, Steve Hoover was hired as a director for a music video for "Fireflies". The video was to have had an exclusive premiere on MySpace, but had been leaked onto YouTube and Dailymotion hours earlier. "Fireflies" became a big sleeper hit, topping the Billboard Hot 100 in the United States for the week ending November 7, 2009. Owl City is featured on Soundtrack 90210 with the song, "Sunburn", which was released on October 13, 2009. Owl City has toured with The Scene Aesthetic, Lights, John Mayer, Maroon 5 and Brooke Waggoner. He was also guest featured in the soundtrack to Tim Burton's Alice in Wonderland with a song, "The Technicolor Phase", that had already been featured in his debut album. In 2010, Young revealed a new musical project known as Sky Sailing, which moved away from his usual electronica genre of music and introduced acoustic guitar and piano accompaniments into his work. The unrefined tracks were recorded in the summer of 2006 before he began making music as Owl City. His first album under this new project is entitled An Airplane Carried Me to Bed, and was released July 13, 2010, via iTunes. In May 2010, Young collaborated with high-profile British electronic composer, producer, musician, and songwriter Nick Bracegirdle. Under his Chicane alias, Bracegirdle released the single "Middledistancerunner" on August 1, 2010, featuring Adam Young on vocals. This is the first single from the fourth Chicane album Giants. He also worked with famed Dutch producer Armin van Buuren, appearing on a track called 'Youtopia' from the van Buuren album Mirage. In September, "To the Sky" was officially released via iTunes on the soundtrack for Legend of the Guardians: The Owls of Ga'hoole. On October 25, 2010, Young released a cover version of the praise and worship song "In Christ Alone" as a streaming MP3 on his website. In November 2010, a new album called Flight was released on iTunes for one of his other musical projects, Windsor Airlift. A new Christmas single called "Peppermint Winter" was also released during that month. Production on Young's third studio album began around mid-2010, with Young being announced as the executive producer of the album. On October 18, Young wrote an entry on his blog regarding his third studio album, saying that the album was nearing completion. In February 2011, the title of the album was announced to be All Things Bright and Beautiful and that the album would be released on May 17. However, on April 6, Young released a statement on his website, along with lengthy previews of four of his songs (Dreams Don't Turn to Dust, Alligator Sky Featuring Shawn Chrystopher, Galaxies, and Deer in the Headlights), that the release date for All Things Bright and Beautiful would be pushed back to June 14. "Alligator Sky" was released as the lead single from the album on iTunes. Later that month and in early April, tickets went on sale for the All Things Bright and Beautiful World Tour, and All Things Bright and Beautiful became available for preorder. The song, "Galaxies" would be released as the second single from the album. The music video for "Alligator Sky" would be released on May 6. Young discussed the concept in a making-of video posted on Owl City's VEVO account, "The concept is basically about these two guys who are leaving Earth. Rather than it being this very dark post-apocalyptic vibe, it's very optimistic, and so it's like people are excited to leave earth." "Deer in the Headlights", the third single from the album, was released on iTunes on May 23. In June of that year, All Things Bright and Beautiful was released on iTunes. Although only a few days prior on May 20, almost all of the album leaked onto the Internet. The music video for "Deer in the Headlights" was released. It features Young driving through the night in a replica of the DMC DeLorean featured from the Back to the Future trilogy. Canadian musician Lights also makes a cameo appearance during the video. "Lonely Lullaby" was released as a single on iTunes, which was previously available only to Owl City Galaxy members, on July 19. Young was interviewed in the August issue of Cliché Magazine. He also appeared on the cover of the magazine and the issue also featured some of Young's very own artwork. Later during the month of July at the Club Nokia concert in Los Angeles, Young announced that the concert was being filmed for a Live DVD. The recording was eventually released on iTunes in November 2011. On November 15, 2011, Jumeirah released a commercial for their famous Burj Al Arab luxury hotel. Young was called upon to compose the music for the commercial. In Young's final tour dates of 2011, he performed a new song entitled "I Hope You Think of Me". On January 2, 2012, Young wrote an entry on his blog regarding his fourth full-length album. Young said that he would be collaborating with more producers and songwriters, saying that his new record "Marks a flying leap in this direction". Young expected the album to be released around late Summer to Fall 2012. In an interview with Billboard, Young revealed that the new album is around 80–85% complete, and that Dr. Luke, JR Rotem, Norwegian production team Stargate, Brian Kennedy and Emily Wright are involved with the production of the album. He was also unsure whether "I Hope You Think of Me" would make the final track listing. Young, along with Jewel and Jay Sean, released a song in promotion of the Child Hunger Ends Here campaign by ConAgra Foods entitled "Here's Hope". On April 17, 2012, "Dementia", a song by Young which was intended to be included on his upcoming album leaked onto the internet. The song features additional vocals by Mark Hoppus of Blink-182. Young announced that a new EP, Shooting Star, was to be released on May 15 and would feature four songs off his upcoming album, so that fans a could get clear taste of what the album would sound like. On May 24, 2012, Young announced on Twitter that Owl City's fourth studio album would be titled The Midsummer Station, and that it would be released on August 14, 2012, worldwide, apart from in the United Kingdom where it would be released on September 17, 2012. On June 21, 2012, Young announced that the release date of the album would be pushed back to August 21, 2012, but the UK release date would remain the same. On July 12, 2012, Young announced via Twitter that the UK release date would be pushed forward to August 20, 2012. Young announced via Twitter that he would be collaborating with Carly Rae Jepsen on a new song, claiming that it would be released on June 26, 2012. On June 20, 2012, he released the single, "Good Time", via his SoundCloud account. The song was released on iTunes on June 26, 2012. It received generally positive reviews from critics, including Billboard: "It only makes sense that he's joined by Jepsen...[on] a track that could become a radio staple for the rest of the summer," and Entertainment Weekly: "'Good Time' goes down easier than a frozen margarita at a beachfront tiki bar." "Good Time" was written by Matt Thiessen, Brian Lee and Young himself. The song debuted at No. 18 on the Billboard Hot 100 and later peaked at No. 8, becoming he second top 10 in United States. On August 8, Young announced through his email newsletter that he would be holding a "Release Day Listening Party" on August 21. and would be doing multiple TV performances, including The Today Show on August 22. On August 18, Young released a small clip of a studio version of "I Hope You Think of Me". The following day, August 19, Young also released two demo songs: "Beautiful Mystery" and "Paper Tigers". On October 5, the single "When Can I See You Again? ", from the Disney film Wreck-It Ralph, was released. On November 6, the EP Good Time (Remixes) was released, featuring many remixes, including one from Young himself. In mid-2012, Universal announced that subsidiary Universal Republic Records would be closed down, with the label's entire roster being transferred to Republic Records; as a result, all future Owl City material will be released on Republic Records. Owl City did not release a full studio album in 2013, despite such reports. In January 2013, Young stated that his new music would contain more EDM songs than his previous studio efforts. He hoped to record a song for the album with Ellie Goulding and claimed that his new album would be "edgy". Instead of a full-length album, Owl City released The Midsummer Station—Acoustic EP on July 30. The EP contained acoustic versions of the songs "Good Time", "Shooting Star", and "Gold", taken from his latest studio album. The EP also contained two previously unreleased B-side tracks: "Hey Anna" and "I Hope You Think Of Me". In the meantime, Young worked on multiple songs for animated films and television commercials. On March 4, the single "Shine Your Way", featuring Young and Yuna, was released on iTunes from the soundtrack to The Croods. Owl City performed a 90-second jingle for Oreo's "Wonderfilled" commercial in May 2013. In June, it was revealed that Owl City would appear on The Smurfs 2: Music from and Inspired By Soundtrack. The track, called "Live It Up", was released in the soundtrack album. Owl City released the single "Light of Christmas", which featured tobyMac, on October 22. The song was created for the 2013 VeggieTales Christmas movie Merry Larry and the True Light of Christmas. 2014 saw the release of the single "Beautiful Times", which features violinist Lindsey Stirling and was released on April 8. Young stated that he intended to release a steady "series of EPs" in 2014 rather than one larger recording, though he later considered and then confirmed that he would be releasing a full studio album in 2014. In June, Young announced that the first extended play would be titled Ultraviolet, and it was released on June 27. The day before, the "Beautiful Times" music video also made its debut on Rolling Stone's website. Owl City appeared on The Art of McCartney tribute album to Paul McCartney, covering the track "Listen to What the Man Said". On October 7, Owl City uploaded the official audio stream for "Tokyo" featuring singer Sekai no Owari to his official OwlCityVEVO YouTube channel. An official lyric video for another new track, "You're Not Alone" featuring Britt Nicole, was published on the following day. In December 2014, Owl City released a new single for Christmas: "Kiss Me Babe, It's Christmas Time". Owl City released a promotional song, "2015", of him singing that he would be releasing a new album. On May 5, a sneak peek of Owl City's then-upcoming song "Verge" featuring Aloe Blacc aired on ESPN's "Draft Academy." The song was released on May 14. An animated video for "Unbelievable" was also released on June 29, 2015 and features Hanson. On December 18, 2015, Young announced that he would focus on a new project: each month [he would] compose and record a score based on a subject of his choice [...] something [he had] wanted to do for a long time. On October 30, 2017, Young announced via his social media accounts that he would be releasing an 18-song album, Cinematic, with a release date of June 1, 2018. He revealed that during the eight months from October to June, three EPs, which he has called Reels, would be released with three songs each. He stated that the inspiration for this album is from "the amazing people [he's] met and the places that [he's] seen." The album's first single, "All My Friends", was released on November 3, 2017. On December 1, 2017, Owl City released the first, Reel 1. On January 12, 2018, a song from the album, "Lucid Dream", was released. The second and third Reels were released in early 2018. Owl City's music is described as indietronica and synth-pop and is often described as belonging under the electronic music genre. Young has stated that he is inspired by disco and European electronic music, as well as instrumental genres such as drone, ambient, and post-rock. He cites his biggest influences as Johnathon Ford of Unwed Sailor and Thomas Newman. Young also incorporates some of his Christian faith into his music, since he is a vocal Christian. Young's faith is evident on the album, All Things Bright and Beautiful, especially in "Galaxies". Explaining why the faith-filled song was added to the mix, he said, "I feel like if I were ever to hide the fact that that's what's so important to me, it would be a crime, that I should probably be put in jail for that." 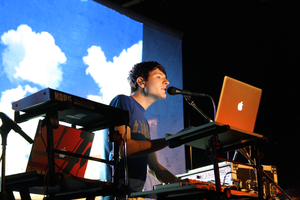 Owl City also has been compared to The Postal Service, often critically, for his combination of fuzzy synths, ironic lyrics and use of female guest singers. Pitchfork.com goes to say that "The surprise No. 1 single in the country, Owl City's 'Fireflies', jacks the Postal Service in such a bald-faced, obvious manner that getting into specifics feels redundant at best and tacky at worst." In response to the suggestion that his work is derivative, Young suggested in a 2009 interview with The New York Times that Ocean Eyes is perhaps the "next chapter" after The Postal Service: "The Postal Service released a record in 2003, and that was it. There was really nothing to compare it to until some one else came along and wrote the next chapter. Maybe that's this record. Maybe that's this band." ^ "Owl City". FreeCCM. FreeCCM. 2015. Retrieved May 5, 2015. ^ "Bio". Owl City. Republic Records. Retrieved June 20, 2014. ^ Kingkade, Tyler (October 7, 2009). "The one man show Owl City". Iowa State Daily. Retrieved December 1, 2017. ^ @owlcity (November 22, 2017). "When I was in college, I worked for Coca-Cola in a shipping warehouse. I was grateful for the job, but as an aspiring artist, I knew it wasn't the right fit for me. The best day of my life was when I was able to quit and work on music full time" (Tweet) – via Twitter. ^ Sisario, Ben (November 20, 2009). "From Mom's Basement to the Top of the Chart". The New York Times. Retrieved December 1, 2017. ^ Riemenschneider, Chris (October 31, 2010). "Owl City goes back to school for Halloween". Star Tribune. Retrieved June 10, 2017. ^ Sisario, Ben (November 20, 2009). "From Mom's Basement to the Top of the Chart". New York Times. Retrieved June 10, 2017. ^ Moring, Mark (June 14, 2011). "Q & A: Owl City". Christianity Today. Retrieved June 10, 2017. ^ Fischer, Reed. "Owl City's reclusive Adam Young opens up - City Pages". City Pages. Retrieved June 10, 2017. ^ Riemenschneider, Chris (February 17, 2009). "Whooo's Owl City?". Star Tribune. Minneapolis. Archived from the original on January 5, 2010. Retrieved November 26, 2009. ^ Sisario, Ben (November 20, 2009). "Adam Young, aka Owl City, Finds Pop Success". New York Times. Retrieved December 24, 2009. ^ a b Frenette, Brad (July 28, 2009). "Band of the Day: Owl City". National Post. Canada. Archived from the original on January 13, 2010. Retrieved January 13, 2010. ^ "Propellerhead – Artist Stories – Owl City". Propellerhead Software. April 2010. ^ "Sky Harbor Studios – Gear List". Sky Harbor Studios. Archived from the original on May 11, 2012. ^ Leahey, Andrew. "Owl City — Biography". Allmusic. Archived from the original on January 13, 2010. Retrieved January 13, 2010. ^ a b c d e f "Interview with Steve Bursky". HitQuarters. July 11, 2011. Retrieved July 24, 2011. ^ "Owl City > Charts & Awards > Billboard Albums". Allmusic. Retrieved November 27, 2009. ^ "Owl City Signs To Universal Republic". crazedhits.com. February 7, 2009. Retrieved July 24, 2011. ^ "Free Download Owl City's new track: "Hot Air Balloon"". ^ "Multi-Platinum International Sensation Owl City Pens Theme Song to Zack Snyder's Animation Debut Legend of the Guardians: The Owls of Ga'Hoole". Jesus freak Hideout. Stunt Company. August 24, 2010. Retrieved May 28, 2011. ^ "Owl City- Fireflies « Quality and Clean". Dorothyinidaho.wordpress.com. October 23, 2009. Retrieved October 11, 2012. ^ "TOP 100 DOWNLOADS OF ALL TIME". BBC. ^ Soeder, John (April 29, 2010). "Owl City takes flight during sold-out show at House of Blues". Cleveland.com. Plain Dealer Publishing. Retrieved September 20, 2016. ^ Wills, Warren (September 23, 2009). "Owl City breaking through the who's-hoot of local electronica". City Pages. Retrieved September 20, 2016. ^ "Info On MySpace premier of Fireflies Music Video off of an Owl City Fan Website". ^ Pietroluongo, Sylvio (October 29, 2009). "Owl City's "Fireflies" Lands at No. 1 on Hot 100". Billboard. Retrieved October 29, 2009. ^ "Sunburn". Retrieved January 6, 2010. ^ "Almost Alice: Various Artists: Music". Retrieved May 28, 2010. ^ Lipshutz, Jason (July 2, 2010). "Owl City's Adam Young Releases A New Old Project". Billboard. Retrieved May 28, 2011. ^ "Sky Sailing". MySpace. May 13, 2010. Retrieved May 28, 2010. ^ "My Hope Is Found". Owl City Blog. Owl City. October 25, 2010. Archived from the original on April 21, 2014. Retrieved April 20, 2014. ^ "Windsor Airlift – Flight". iTunes. ^ "A Letter from Adam Young « Owl City Blog". Owlcityblog.com. June 29, 2010. Archived from the original on March 11, 2012. Retrieved February 20, 2012. ^ "Ear Candy « Owl City Blog". Owlcityblog.com. July 26, 2010. Archived from the original on January 17, 2012. Retrieved February 20, 2012. ^ "An Essential Studio Update « Owl City Blog". Owlcityblog.com. October 18, 2010. Archived from the original on January 1, 2012. Retrieved February 20, 2012. ^ "Owl City Pushes Back New Album". Christian Rock Rocks. April 7, 2011. Archived from the original on March 4, 2012. Retrieved February 20, 2012. ^ All Things Bright And Beautiful. "All Things Bright And Beautiful: Owl City: Music". Retrieved October 11, 2012. ^ "OWL CITY Official site – News". Owlcitymusic.com. March 22, 2011. Archived from the original on January 31, 2013. Retrieved February 20, 2012. ^ "OWL CITY Official site – News". Owlcitymusic.com. April 1, 2011. Archived from the original on November 25, 2013. Retrieved February 20, 2012. ^ "OWL CITY Official site – News". Owlcitymusic.com. May 2, 2011. Archived from the original on September 7, 2012. Retrieved February 20, 2012. ^ "OWL CITY Official site – News". Owlcitymusic.com. March 22, 2011. Archived from the original on November 30, 2012. Retrieved February 20, 2012. ^ Hensel, Amanda. "Owl City's 'Alligator Sky' Video With Shawn Chrystopher Is Out Of This World." Pop Crush. May 2011. Retrieved July 18, 2011. <http://popcrush.com/owl-city-alligator-sky-video/>. ^ "'Back to the Future' DeLorean Stars in Owl City's New Music Video". The Hollywood Reporter. October 7, 2011. Retrieved May 17, 2014. ^ a b Graff, Gary (February 28, 2012). "Owl City '80, 85 Percent' Done with New Album". Billboard.com. Detroit. ^ "Adam Young - Burj Al Arab commercial". YouTube. Retrieved June 23, 2014. ^ "I Hope You Think of Me- *NEW* Owl City Song". YouTube. November 12, 2011. Retrieved February 20, 2012. ^ "Men With Pointy Teeth « Owl City Blog". Owlcityblog.com. January 2, 2012. Archived from the original on February 19, 2012. Retrieved February 20, 2012. ^ Cerra, Allison (March 5, 2012). "ConAgra Foods taps recording artists for annual Child Hunger Ends Here campaign". Drug Store News. Retrieved March 5, 2012. ^ "First Listen: Owl City combines with Mark Hoppus for new track 'Dementia'". HITFX. Retrieved April 17, 2012. ^ "Twitter / owlcity: The legitimate, confirmed". Twitter. May 24, 2012. Archived from the original on November 16, 2013. Retrieved May 25, 2012. ^ "Owl City's 'The Midsummer Station' Mystery Album Unlocked by Fans". The Christian Post. May 31, 2012. Retrieved June 2, 2012. ^ Name. "OWL CITY Official site – News". Owlcitymusic.com. Archived from the original on June 28, 2012. Retrieved June 21, 2012. ^ "Twitter / owlcity". July 12, 2012. Archived from the original on November 16, 2013. Retrieved July 18, 2012. ^ "Twitter / owlcity: Incredibly thrilled to ann". Twitter. Retrieved June 21, 2012. ^ 0.00. "OwlCityOfficial's sounds on SoundCloud – Create, record and share your sounds for free". Soundcloud.com. Retrieved June 21, 2012. ^ a b Hoffa, Meredith. "Carly Rae Jepsen and Owl City have a 'Good Time' in new collaboration: Hear it here | EW.com". Music-mix.ew.com. Retrieved June 21, 2012. ^ "Carly Rae Jepsen & Owl City Team Up for 'Good Time' Summer Anthem: Listen". Billboard. September 14, 2009. Retrieved June 21, 2012. ^ "Owl City, Carly Rae Jepsen Ready for 'Good Time' on Hot 100" (in Portuguese). Billboard.com. September 14, 2009. Retrieved October 11, 2012. ^ a b "Owl City: The Official Newsletter". Retrieved August 21, 2012. ^ "Adam Young - Coming soon". Ayoungblog.com. August 18, 2012. Archived from the original on August 22, 2012. Retrieved October 11, 2012. ^ "Adam Young - Working demo for a new song called "Beautiful". Ayoungblog.com. August 19, 2012. Archived from the original on October 23, 2012. Retrieved October 11, 2012. ^ Maggie Malach (October 5, 2012). "Owl City, 'When Can I See You Again' Audio Premiere: Adam Young Pens Song for Disney Soundtrack - AOL Music Blog". Blog.music.aol.com. Retrieved October 11, 2012. ^ "iTunes - Music - Good Time (Remixes) - EP by Owl City & Carly Rae Jepsen". Itunes.apple.com. November 6, 2012. Retrieved March 7, 2013. ^ "Owl City now with Republic Records". Archived from the original on October 30, 2012. Retrieved November 24, 2012. ^ "Bright Eyes". Adam Young Music. Retrieved June 9, 2015. ^ "Owl City's Adam Young covers "Bright Eyes"". Republic Records. January 7, 2013. Archived from the original on June 10, 2015. Retrieved June 9, 2015. ^ "A Q&A with Owl City". 4music.com. Archived from the original on January 28, 2015. Retrieved June 9, 2015. ^ "Jesusfreakhideout.com 2011 interview with Owl City". Jesusfreakhideout.com. Archived from the original on January 28, 2015. Retrieved June 9, 2015. ^ "Owl City Already Working on New Album @ARTISTdirect". Artistdirect.com. Retrieved July 3, 2013. ^ "Twitter / owlcity_news: Owl City: 5th Studio Album". Twitter.com. Retrieved July 3, 2013. ^ "Owl City Wants Ellie Goulding Collab, Says Next Album Will Be 'Edgy'". Billboard. December 5, 2012. Retrieved July 3, 2013. ^ Ableson, John. "Owl City Announce 'The Midsummer Station Acoustic' EP". Alter The Press. Retrieved July 29, 2013. ^ a b "The Midsummer Station Acoustic EP Tracklist". Owl City Official Site - News. Sky Harbor Entertainment. July 11, 2013. Archived from the original on September 11, 2013. Retrieved July 29, 2013. ^ "Owl City confirmed new acoustic EP". Josep Vinaixa. July 4, 2013. Archived from the original on July 9, 2013. Retrieved July 5, 2013. ^ "Twitter / owlcity: Hear the new song from Owl". Twitter.com. Retrieved March 7, 2013. ^ Montgomery, James (May 13, 2013). "Owl City's Oreo Commercial Has Him Feeling 'Wonderfilled'". MTV News. Retrieved June 6, 2013. ^ "Twitter / owlcity: status". Twitter.com. Retrieved October 22, 2013. ^ Owl City. "Light of Christmas (feat. Toby Mac)". iTunes. Apple, Inc. Retrieved October 29, 2013. ^ "Duck Dynasty's Si Robertson Joins Owl City and Toby Mac in Newest VeggieTales Christmas Movie". Retrieved April 3, 2014. ^ "Merry Larry and the True Light of Christmas on the Veggietales Store". Retrieved April 3, 2014. ^ Bird, Michele (April 4, 2014). "Owl City to release new single, "Beautiful Times"". Alternative Press. Retrieved September 14, 2014. ^ "Owl City Announces New EPs For 2014". Freqazoid.com. FreQ Media. April 8, 2014. Retrieved September 14, 2014. ^ Sharp, Tyler (June 6, 2014). "Owl City announces 'Ultraviolet' EP". Alternative Press. Retrieved September 14, 2014. ^ "Guys! My next release will be available on 6/27..." Tumblr. Archived from the original on June 6, 2014. Retrieved June 2, 2014. ^ "Watch Owl City's Whimsical 'Beautiful Times' Video - Premiere". Rollingstone.com. June 26, 2014. Retrieved June 26, 2014. ^ Daw, Robbie (June 26, 2014). "Owl City Premieres "Beautiful Times" Video, Readies 'Ultraviolet' EP For Release Tomorrow". Idolator. SpinMedia. Retrieved September 14, 2014. ^ Grow, Kory (September 9, 2014). "Paul McCartney Tribute Comp: Bob Dylan, Kiss and More Cover the Beatle". Rolling Stone. Retrieved September 14, 2014. ^ "Owl City - Tokyo (Audio) ft. Sekai No Owari". YouTube. Retrieved October 10, 2014. ^ " "Owl City - You're Not Alone (Lyric Video) ft. Britt Nicole". YouTube. Retrieved October 10, 2014. ^ Woods, Tam (December 17, 2014). "Owl City Releases New Christmas Single 'Kiss Me Babe, It's Christmas Time', Listen Here (VIDEO)". Celebeat. Retrieved December 24, 2014. ^ "New Owl City Holiday Song, "Kiss Me Babe, It's Christmas Time"". Owl City. Archived from the original on December 24, 2014. Retrieved December 24, 2014. ^ "2015". SoundCloud. Retrieved April 22, 2015. ^ "ESPN Music on Twitter". Twitter. Retrieved May 6, 2015. ^ "Owl City reveals new album, 'Mobile Orchestra'". altpress.com. May 11, 2015. Retrieved May 12, 2015. ^ Owl City - Unbelievable (Animated Main Video) ft. Hanson. YouTube. June 29, 2015. Retrieved July 16, 2015. ^ Newman, Melinda (March 3, 2016). "Owl City's Adam Young Is Creating a Film Score a Month For One Year". Billboard. Retrieved November 14, 2016. ^ "Adam Young Scores coming 2016". www.owlcitymusic.com. December 18, 2015. Archived from the original on October 25, 2016. Retrieved November 29, 2016. ^ "Video 'Owl City - Humbug Holiday Announcement' (1:51)". YouTube. November 24, 2016. Retrieved February 7, 2017. ^ a b Owl City (October 30, 2017). "Owl City - Cinematic (Album Announcement)". Retrieved November 6, 2017 – via YouTube. ^ "Instagram post by Adam Young • Oct 30, 2017 at 4:22pm UTC". Instagram. Retrieved November 6, 2017. ^ "Itunes 'Owl City - Cinematic'". Itunes. 2017. Retrieved November 4, 2017. ^ Boller, Jay. "Owl City, Minnesota's biggest pop star, is bro-country now - City Pages". City Pages. ^ "Youtube 'Owl City - Lucid Dream'". YouTube. 2018. Retrieved January 13, 2018. ^ "Owl City announces 'Cinematic' North American tour". Niagara Frontier Publications. April 20, 2018. Retrieved May 4, 2018. ^ "Interview Of Adam Young Master Mind Behind Owl City". azTeen Magazine. March 1, 2010. Archived from the original on May 22, 2011. Retrieved February 21, 2011. ^ Fitzmaurice, Larry (June 1, 2008). "Hot New Band: Owl City". Spin. Archived from the original on June 11, 2009. Retrieved November 27, 2009. ^ Moring, Mark. "Owls, Fireflies, and Jesus". Christianity Today. Retrieved February 19, 2011. ^ Owl City Reveals "All Things Bright and Beautiful, CBN.com. ^ Westhoff, Ben (October 28, 2009). "Owl City: The Latest In A Long Line Of Rip-Offs". Dallas Observer. Retrieved November 26, 2009. ^ Cohen, Ian (November 5, 2009). "Track Reviews: Owl City – "Fireflies"". Pitchfork Media. Retrieved November 26, 2009. ^ Sisario, Ben (November 21, 2009). "From Mom's Basement to the Top of the Chart". The New York Times. Retrieved March 12, 2010. ^ Owl City: Live from Los Angeles (Movie). Los Angeles: Eagle Rock. 2011. Verification is in the closing credits to the film. ^ "AKB48, Carly Rae Jepsen Win Big at Billboard Japan Music Awards". msn.com. December 19, 2012. Retrieved December 29, 2013. ^ "Winners for 'Billboard JAPAN Music Awards 2012′ announced". tokyohive.com. December 15, 2012. Retrieved December 29, 2013. Wikimedia Commons has media related to Owl City.